County councillors have backed a decision to cut the amount of recycling credits paid to West Sussex districts and boroughs. The county pays its second tier councils a certain amount per tonne for any waste they divert from landfill for recycling or reuse. The decision to reduce that payment was described as an ‘outrageous rip-off’ by some Labour and Lib Dem councillors, and called in for further debate. In a statement to the environment, communities and fire select committee on Monday, Sue Mullins (Lab, Northgate & West Green) told members that cutting the payments from £67.46 per tonne to £61.12 would cost the district and boroughs £1.2m and could lead to a reduction in recycling rates. Mrs Mullins questioned the legality of the decision and warned that it would damage the relationship between the county and the district and borough councils. Deborah Urquhart, cabinet member for environment, described the recycling credits scheme as ‘not fit for purpose’ and said the council had to find new ways of increasing recycling levels. She told members that, despite the county having one of the best material recycling facilities in the country, there had been little improvement in kerbside recycling rates over the last eight years. Ms Urquhart added: “In four out of our seven districts and boroughs, the performance is worse than it was in 2010. “In that period, the county council has provided around £41.5m of funding to the districts and boroughs, but as a county we have fallen significantly behind the performance of our neighbours. 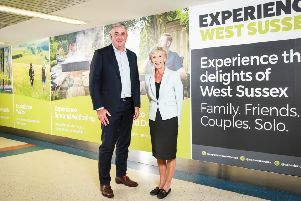 Ms Urquhart described the West Sussex credits scheme as ‘unusually generous’ and pointed out that payments to the districts and boroughs would still add up to £4.6m in 2019/20, which would save the county around £1m. She also questioned whether all the money was being used to improve recycling rates or had been going into the various councils’ reserves. The subject of savings was seized upon by Michael Jones (Lab, Southgate & Gossops Green) who had asked why the proposed changes could not wait until the government had carried out a review of its Resources and Waste Strategy.